Finely dice bacon and fry over medium heat in a large pan until crisp (cast iron works well for this). Remove cooked bacon from pan and drain off all but 4 tablespoons of bacon grease. Add diced potatoes to pan and stir-fry in bacon fat until browned and crisp; remove from pan. Melt butter in pan; add chopped onions and sauté just until limp. Add chopped meat and brown, about five minutes. Reduce heat to low; return bacon and potatoes to pan, mixing all ingredients and heating until warm. In a separate pan, fry the eggs "sunny-side up." 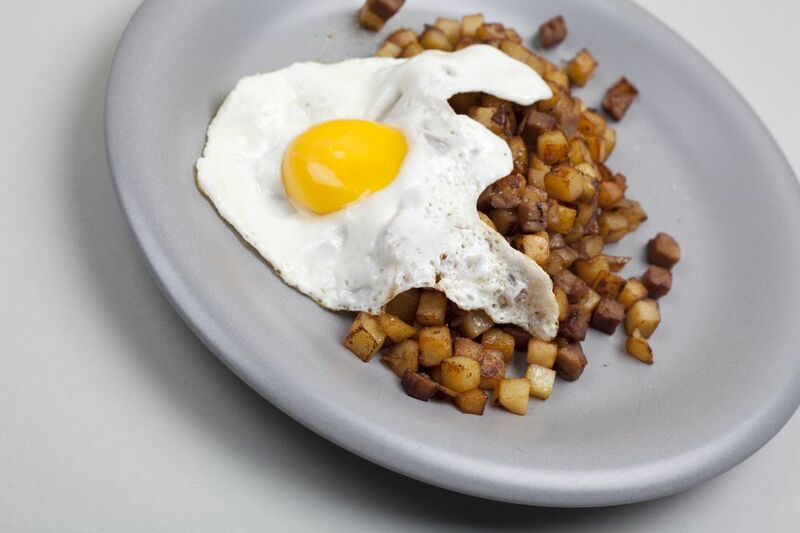 Transfer the hash to individual plates and crown with a fried egg on top of each serving.